'Science Guy' Attends State Of The Union Address, And Some Scientists Aren't Happy : The Two-Way When Bill Nye said he would attend the speech alongside Rep. Jim Bridenstine, the Trump administration's nominee for NASA administrator, it didn't sit well with some scientists. 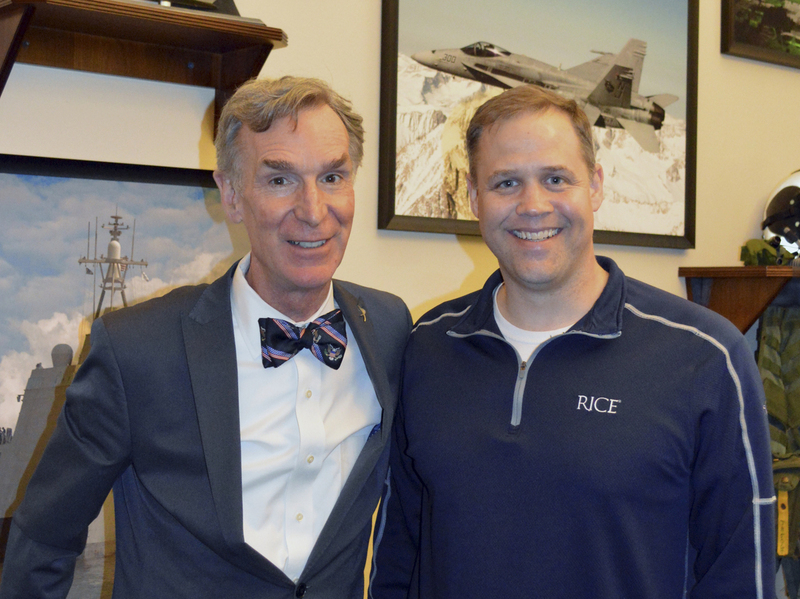 Bill Nye (left) and Rep. Jim Bridenstine pose in a photo from February 2017 that was provided by the office of Congressman Jim Bridenstine. The decision by Bill Nye to attend the State of the Union Address alongside the Trump administration's nominee to head NASA has put the celebrity science educator at odds with many scientists. Nye, who starred in the children's program Bill Nye the Science Guy and now has his own Netflix original series, Bill Nye Saves the World is also CEO of the Planetary Society. On its website earlier this month, The Planetary Society made the announcement that Nye had been asked and accepted an invitation to attend the speech with Oklahoma Republican Rep. Jim Bridenstine: "When a congressman and current nominee for NASA Administrator asks you to be his guest at the state of the union address in Washington, D.C., how do you respond? For us, the answer was easy. Yes, Bill would be there." Nye and The Planetary Society took pains to say that accepting the invitation was not an endorsement of the administration or its policies. Even so, that did not sit well with many in the scientific community, who are not happy about Bridenstine, a tea party conservative who has espoused climate denial myths in the past and who navigated a fine line on the subject during his Senate nomination hearing in November. In an editorial published Tuesday on Scientific American magazine's website, a group known as 500 Women Scientists argued, "by attending the SOTU as Rep. Bridenstine's guest, Nye has tacitly endorsed those very policies, and his own personal brand over the interests of the scientific community at large." "Rep. Bridenstine is a controversial nominee who refuses to state that climate change is driven by human activity, and even introduced legislation to remove Earth sciences from NASA's scientific mission," the editorial said. "Further, he's worked to undermine civil rights, including pushing for crackdowns on immigrants, a ban on gay marriage, and abolishing the Department of Education." "As women and scientists, we refuse to separate science from everyday life. We refuse to keep our heads down and our mouths shut," the editorial read. "As someone with a show alleging to save the world, Bill Nye has a responsibility to acknowledge the importance of NASA's vast mission, not just one aspect of it. He should use his celebrity to elevate the importance of science in NASA's mission—not waste the opportunity to lobby for space exploration at a cost to everything else." In a rebuttal to the editorial, The Planetary Society's director of space policy, Casey Dreier wrote, "I want to restate the fact that attending the SOTU as Bridenstine's guest does not mean that either Bill Nye or The Planetary Society is endorsing his nomination. The Society does not make endorsements for NASA Administrator nominees—we are committed to working with whomever serves in that position." "Our relationship with Bridenstine and his office goes back years due to his involvement in the House Space Subcommittee, which has oversight over NASA," Dreier said. "Space exploration is one of the few areas of politics that still offers significant opportunities for bipartisan rapprochement. A shared passion for space can lay the groundwork for a relationship between individuals of very different political beliefs," he added. However, the address may have been something of a disappointment for Nye, who said ahead of it that he hoped "to hear the president present plans for an ambitious, science-driven space exploration agenda." On Tuesday night, the president's speech contained nothing about NASA or the future of America's space program.